It has been nothing but a great start to the 2019 calendar year! In January, my home club (Lauderdale Yacht Club) hosted the U.S. Laser National Championship. It was such an incredible feeling to compete at the venue where my sailing endeavors began. After having a rough first race and a BFD in the following races, I gave everything I had to get into a podium position for the last day. I ended the event with a bronze medal. This was one of my most proud moments in sailing. I wasn't necessarily happy with the fact that I had placed 3rd, but I was proud of the fact that I had overcome adversity. A few bad scores wasn't going to alter my mindset. I was there to try to learn and, in process, win the event if I could. A month after the U.S. Nationals, I competed in the Hempel Miami World Cup Event. The regatta exclusively included only the top sailors from around the world in each respective Olympic class. Throughout the week of racing, the weather brought challenging conditions. Every day the strategic and tactical priorities on the course changed making each day unique to the previous. Some days there were two different breezes fighting and trying to determine which one would win out became a major strategical component. Other days brought major storm systems that manipulated wind shifts across the course. With these strange weather patterns influencing the racing, it created a perfect opportunity to see what conditions I had nailed and what I still needed to master moving forward. With two great scores on the final day of racing, I was able to secure a spot in the medal race! Similar to the rest of the week, the medal race was no exception when it came to unpredictable wind. The wind was light, the shifts were irregular, and the pressure was inconsistent. With the points so close, not many places to gain but several to lose, the goal was to come up with a conservative plan that allowed me to stay close to my competition during the race. However, things don't always line-up how you want them too. On the start line, I found both of my competitors on the opposite side of the line and at "go" they were headed towards opposite sides of the course. With this in mind, I started in the middle of the fleet which gave me the opportunity to pick which side I thought would be the most threatening. In the end, I played my cards right and finished the race in 4th which was enough to keep my 6th place finish in the event. Overall, I couldn't be more thrilled with how this year has started out. Last year, after the Enoshima World Cup, I took the time to sit down and review the things that went well and the things that needed some tweaking. During the fall/winter months, while people were taking time off from sailing, I was training and working on fixing things. It just goes to show that there truly is no such thing as an 'off season'. If you want to get ahead of the competition, you have to study your strengths and weaknesses then go out and work for it. Thank you to coach Steve Mitchell and the US Sailing Team & Staff for their hard work and continuing support. I can't wait to see what we achieve the rest of the year! Just two weeks ago, the 2018 ISAF World Championships came to an end. In a very competitive fleet consisting of the top 120 Women Radial sailors in the world, I finished up the event in 11th place, just shy of competing in the medal race. With all the months of training and preparation leading up to the event, I feel as though I underperformed. Though this was not the result I had hoped for, I learned valuable lessons that I know I will help me down the road as the Olympic Games approaches. On another note, the United States Sailing Team received one of the 2020 Olympic Games Laser Radial berths with two Americans placing within the top 20 nations at the Worlds (this means our county's spot is secured for Tokyo!). With this being the main goal of the event, I am happy we were able to achieve what we set out to do. Olympic Games berths were also awarded to United States in the Laser (men's single-handed class) and the 470 (men's double-handed class). With my performance leaving me unsatisfied, I am hungry for a spot on top of the podium. Looking forward, the next events are the Enoshima World Cup (September 11th- 16th) and the Enoshima Olympic Week (September 22nd -24th). I feel so fortunate to have an opportunity to capitalize on the lessons I learned at the Worlds so soon after the event's completion. It has been a year since I have competed in Japan on the 2020 Olympic Games waters and I could not be more excited to sail my heart out there in just a few short weeks! A sincere thank you to all my sponsors HELLY HANSEN, HARKEN, ALMACO, and NAUTALYTICS ! My dream wouldn't be possible without your encouragement and support. And another thank you to all my family and friends! You guys are the absolute best at making me smile no matter how challenging of a day it has been. Back in the USA after competing in the Trofeo Princesa Sofía Regatta (April 2nd - 7th). Palma de Mallorca seemed to throw every condition at us throughout the week. Everyday was completely different than the previous making the event both exciting and challenging. With some unforced errors in a few of the races, I fell just short of the medal races finishing the regatta in 13th out of 115 boats. Though this is not the result I was looking for, I am beyond proud to say that I improved on the goals I had set for myself after the Miami World Cup Event. Specifically, one of these goals focused on polishing up on my steering and sheeting technique in the breeze. During the two months between Miami and Palma, Coach Steve and I honed in on this area of weakness present in Miami by using every opportunity on the water to progress in heavy air technique. After two months of hard work on the water and in the gym, my best two Gold Fleet finishes at the Princesa Sofía were on the windiest day! In 18-22 knots, I scored an 11 and 12. In fact, if it wasn't for a capsize at the bottom of the final downwind in the second race (whoops! ), I would have placed even better (haha). I must say, it was an absolutely epic flip though...I went for a gybe on a monster of a wave and my feet ended up over my head and my back slamming against the centerboard. I even lost my visor and new Love Your Melon beanie (RIP). Lost clothing articles aside, when I finished the race I couldn't help but have a huge smile plastered on my face because I had taken a step forward in the game and improved on one of my goals. Up next is the Hyeres World Cup Event (April 24th - 29th) and the European Championship (May 7th - 12th). Treating the Palma regatta and these next two events as practice for the 2018 Hempel Aarhus ISAF World Championships in August, results will not be my main focus but capitalizing on my process goals will. The purpose of this is to fine-tune and hone in on the little details before competing in the peak event of the year. Leaving in only 1.5 weeks, it will be a quick turn around to Europe. Even though, I just got back home last night, I already can't wait to see all my friends and competitors again soon! Camaraderie is one of the coolest things about this sport and I am so thrilled to have friends that share my passion for sailing. Last week I competed in the second World Cup Event of 2018 (the first in October of 2017 in Gamagori, Japan). This event is always close to my heart because it is the only World Cup Event held in the United States and the venue, Miami, Florida, is only a short forty-fives minutes away from where I grew-up. Every year I enjoy showing off my home state to international friends and competitors making sure they hit all the local spots down in Coconut Grove. It is an awesome feeling to have so many international athletes come to compete on our home waters and want to experience the American culture. This years event was unlike previous years. In November, Category 5 Hurricane Irma, ripped through Florida. Miami had suffered severe damage and flooding across the city. In fact, Regatta Park and the U.S. Sailing Center were completely underwater after the storm with debris and boat remnants strewn across the area. After such a blow, World Sailing was hesitant to let U.S. Sailing host the event fearing that Miami would not bounce back in time. Nevertheless, the Coconut Grove community and U.S. Sailing came together, cleaned-up the Grove, and by the time the regatta came around the area was almost as good as new. It always amazes me how people come together after such a heart breaking disaster. It really shows the good in the world. During the event, we had a mix of challenging conditions. Racing was canceled at 1:30PM the first day due to no wind on the course. When racing is canceled so early, sometimes it is hard to know what to do with the rest of your day because as an athlete, you want to keep your head in the game but also use the time to relax. Doing just that, I went to the gym and did a light workout, then I headed to a bookstore to catch up on some reading. The next day, I woke up feeling even more ready than the first. That day we had about 6-10 knots on the race course and lots of sunshine! In the first two races, I struggled getting off the line but managed to fight my way back into the leading pack. With the wind being unstable and seventy boats racing at once, scores in the top twenty were keepers. It seemed like everything was lining-up and my day was going to be going well. However, in the third race of the day, I struggled again getting off the line and then collided with a port boat. This set me far back in the race and forced me to the opposite side of the course. From there, I couldn't manage to find a clear path back into the leading pack. This is definitely something I plan to work on in the future because the sailors that can chip their way back into the top twenty after such a set-back are the ones that come out on top in the end. The next day, we were blessed with a bit more breeze (~17-20 knots) but still had challenging oscillating wind conditions. Again in the first race I was able to secure a top twenty. However, not finishing in the top pack lit a flame of urgency under me. As a result, in the second race I pushed the starting line a bit too hard and was Black Flagged (BFD). This disqualified me from competing in the following race. As much as it pained me to not compete in the next race, I decided to get rid of the emotion in my head and be objective and identify what the issue was. I had been suffering in races due to starting. So, after the second race started and my competitors cleared the starting line, I stayed out and used the line to practice my starts. After about 30 runs at the line, I felt confident going into the next day of racing. On day four we arrived at Regatta Park with the wind howling (~ 27-35 knots). Instead of rigging boats, all the competitors sat around wondering if we would be delayed ashore. Sure enough, the AP Flag went up and once again we found ourselves waiting on shore for the race committee to make the call on whether we would sail that day. With the wind strengthening and the sea-state becoming more aggressive throughout the day, it became clear that we were not going to leave the dock. After five hours of waiting, at 3PM racing was canceled. With no racing and strong breeze still forecasted for the following day, I made sure to keep my body active with a light gym session and some stretching to prepare for the three races scheduled tomorrow. It seemed absurd that we had only sailed five races in four days. However, with three races scheduled the following day, it meant that about a third of the regatta would come down to the final day. Knowing this, I went out determined to focus on getting off the starting line clean and I did just that. It was extremely rewarding to see just thirty minutes of extra time on the water pay off instantly. Nevertheless, I soon discovered that I had another skill set to master in the 18-23 knot range. Even though I was getting off the line clean, I struggled to find my way up the course tactically. I was extremely "head in the boat" never really looking around me on the race track for information that could have been useful. In other words, I was too set on going fast that I missed tactical opportunities to make a gain. The great news about this all is that I was FAST in these conditions. In the past, stronger breeze has been a weakness and I have been working really hard to perfect my technique. Finally, I have made progress on that front and it is a huge relief. The next step is to now get myself looking outside of the boat. Overall, I finished the regatta placing 31st. Though I am disappointed in the result, I am not disheartened. The event brought out areas that I have improved on and areas that I need to work on before the 2018 World Championships in August. Taking in the positives, this event was a great starting point for the year and now that I know what my areas of focus are, I am committed to making them strengths prior to the Worlds. Just finished up my final training camp of the year! U.S. Sailing Team Coach, Steve Mitchell, along with Sail Canada's Coach, Vaughn Harrison, helped me host a nine-day clinic in the Fort Lauderdale/Miami area. Joining us for the camp were my international training partners Monika Mikkola (Finland), Pernelle Michon (France), and Sarah Douglas (Canada). For the first five days, we sailed out of Lauderdale Yacht Club. Though we had some cold and tricky northwesterly breezes, Lauderdale blessed us with clear sunny skies and good hiking conditions the entire time. With only four boats, speed tuning was our focus while training. It felt great to be back in the straps after taking a month off after Enoshima Olympic Week in Japan. After an awesome five days out on the Atlantic Ocean, we loaded our lasers into the hulls of two VSR coach boats and headed for the U.S. Sailing Center in Miami. On the trip down, everything was running smoothly until the trailer got a flat tire on I-95. At that time, we were only five miles away from reaching the U.S. Sailing Center in one piece. With the help from some LYC parents and Coach Steve (and no help from AAA), we decided we were going to try to make it with a flat. The good news is that we made it! The next four days my training partners and I were joined by youth members of the LYC High Performance Team for practice. It was an amazing experience getting to train and race against some of the most talented youth in the country. Another perk to training on Miami's Biscayne Bay is that it will host the 2018 Miami World Sailing Cup Series (Round 2) in late January. 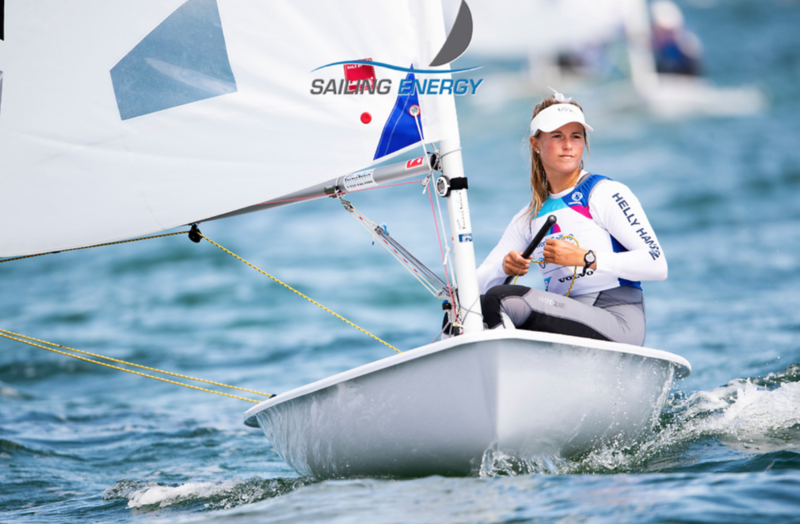 Up next is the US Sailing Team Camp in Miami starting on January 3rd! Even though I just finished a nine-day camp, I am already excited to start the next one. From now till then, I will be enjoying some quality time with friends and family during the holiday season.